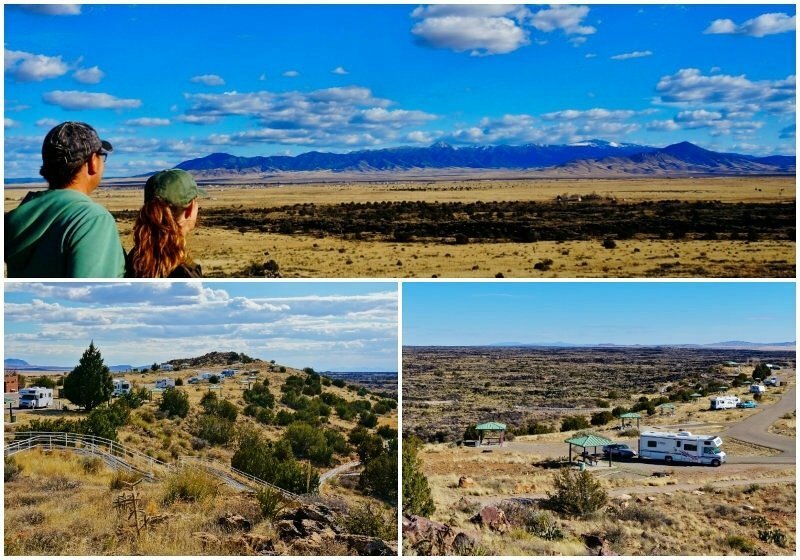 Ever since we set off as full-time RVers almost 5 years ago it’s been a goal of ours to immerse ourselves in nature’s beauty. My wife and I both love to hike and photograph scenic landscapes and wildlife or just chill in our camp chairs drinking in the view. Each snowbird season we are drawn back to our favorite places but also make a concerted effort to seek out new horizons. Last year was a banner year for that. In early spring, we pushed our way east as far as Texas then looped back through New Mexico and Utah before heading back up the coast to BC. 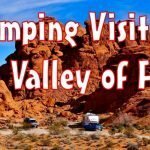 As I look back on another amazing year of memorable camping spots I’ve picked out 10 of the coolest. Here they are in chronological order. 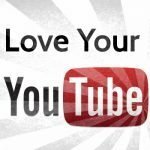 Click photo collages or headings for more in depth information and video footage of most camping spots. 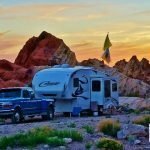 We heard about this place from some fellow RVers. They told us of a massive flock of Sandhill Cranes that roost here during the winter months. In the wee hours of the morning, thousands set flight all at once. It was a must-see event they said. 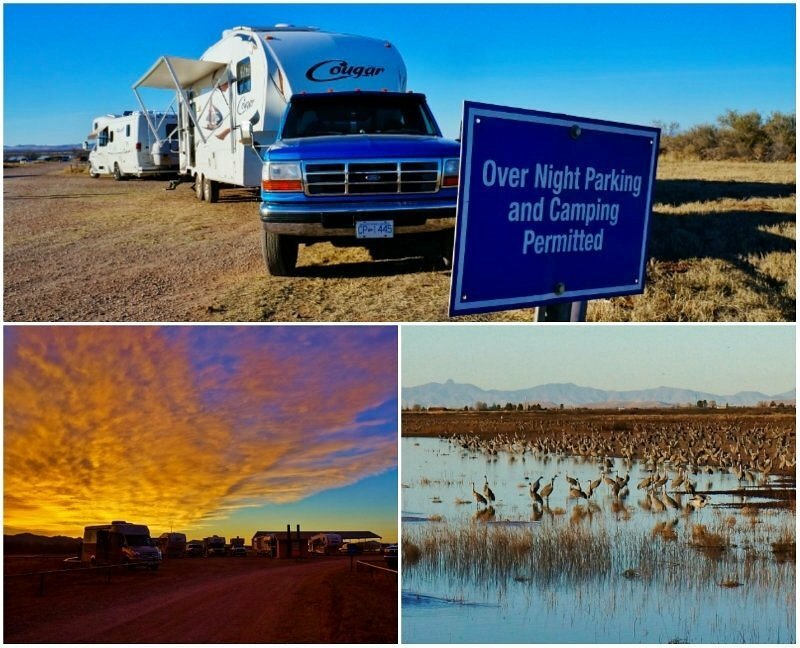 I did a little research and found out the wildlife refuge allowed limited overnight dry camping right in the parking lot! We arrived early one morning and grabbed ourselves a spot and lucky we did as the tiny lot filled fast. For the next three days (max time allowed) we had a blast watching the Sandhill Cranes and chatting with fellow campers in the tight little parking area. My memories are highlighted by one of the most beautiful fiery desert sunsets I’ve ever seen and the sounds of thousands or air born cranes. 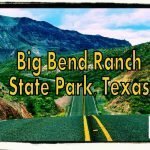 A goal for us in spring 2015 was to revisit Big Bend National Park, but to get there we had to cover a lot of ground from Arizona east. 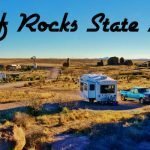 So, while looking online for a possible place to break up the travel I came across City of Rocks State Park. I’ve always had great experiences in the New Mexico state parks. They usually have large clean sites at a bargain price compared to other states. 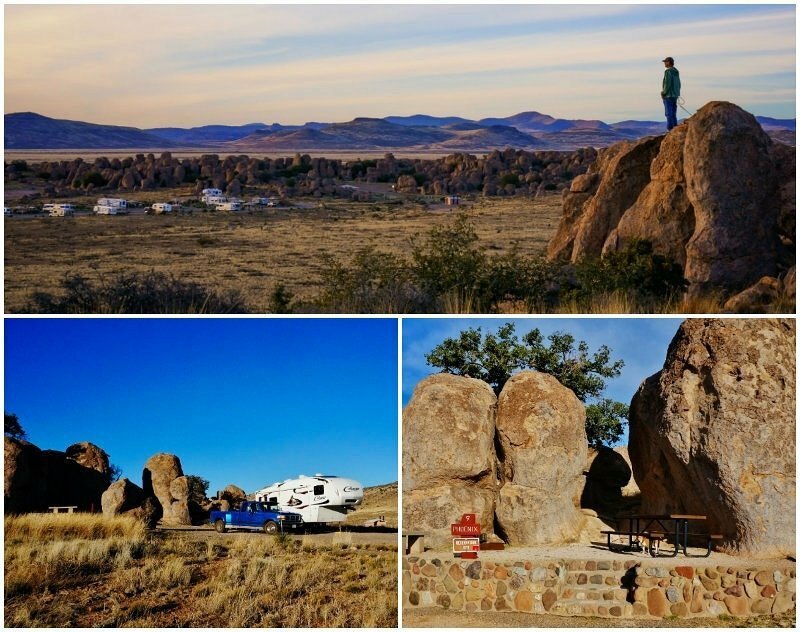 The City of Rocks is located on a high desert grassy plateau offering expansive views and fun hikes in among the huge boulders and rock outcroppings. 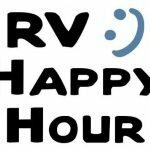 They have a row of full hook-up RV sites however, we took a dry camping site to save some cash and get a little more elbow room. 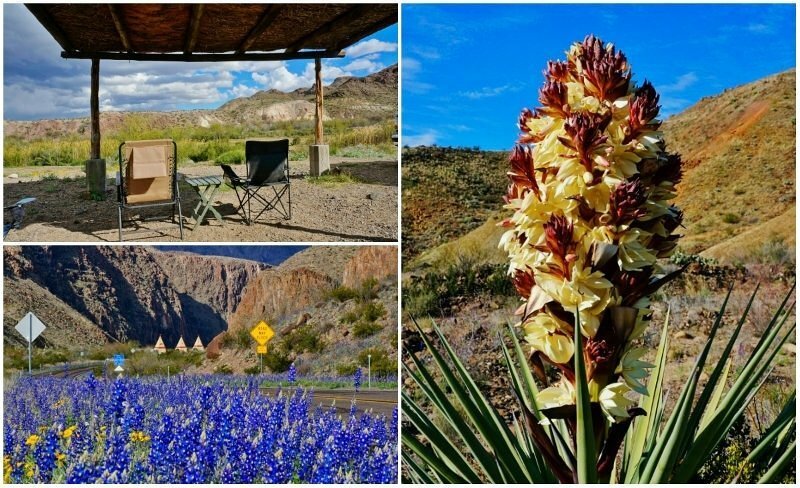 During our 2012 visit to Big Bend National Park, we became aware of the equally gorgeous but much less visited Big Bend Ranch State Park. This trip we made a special point of spending time camped there. It did not disappoint. We set up in a valley location right on the grassy banks of the Rio Grande. Anne and I had luckily stumbled in at the peak of a banner year for spring flowers. Everything was in bloom from carpets of bluebonnets to multiple varieties of cacti to huge flowering yucca plants. Everywhere we looked were vivid colors contrasted against the normally drab desert landscape. Add to that a few passing thunderstorms and we were in photography heaven. Valley of Fires was not on the radar until we were literally driving by it. Holy crap what a cool camping spot. We had to stop. Both of us love to travel by the seat of our pants without fixed schedules and reservations for just such a circumstance. The camping area is located on a small hill above a thousands year old lava field, that has created a most interesting and unique ecosystem. The most striking of which is the plethora of green leaf long stemmed Sotol plants dotting the blackened landscape. Off in the distance are views of snow-capped mountains. Absolutely stunning on a clear day. 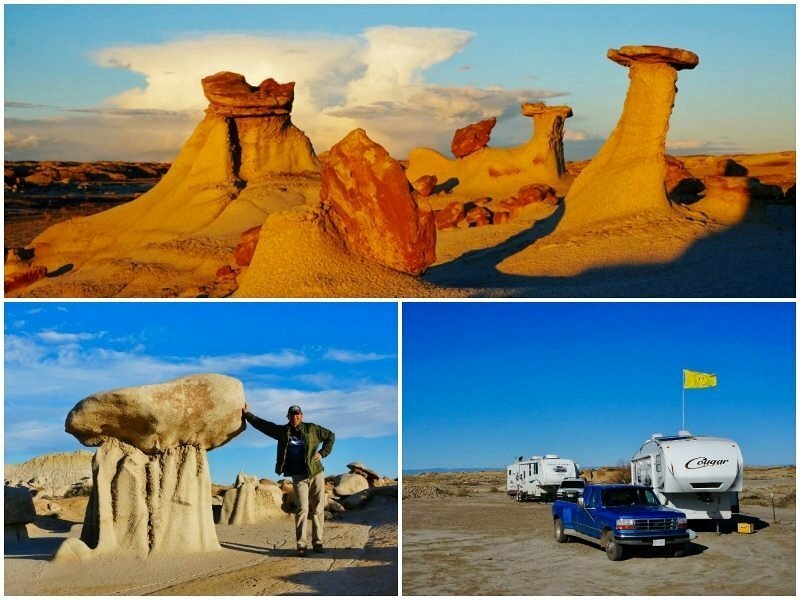 I admit I was a little hesitant to make the long drive into the north-west corner of New Mexico to see the Bisti Badlands, but it has been on Anne’s photography bucket list for a long while. So, off we went. Happy wife, happy life, right? Turns out it was one of the most fun camping spots of the year. We met up with new friends from Wyoming I had previously only known online and had a bang up time. The actual campsite wasn’t anything special just a dirt parking area, but it was right at the gates to the foot traffic only Bisti wilderness and free. 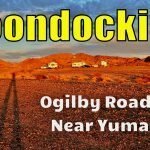 The closest RV parks were 30 plus miles away and 20-35 bucks a night. 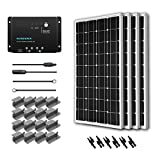 Being outfitted for off grid camping sure has it’s advantages. We were able to easily enjoy the Bisti Badlands at it’s most beautiful in the golden light of sunrise and sunset. What a magical landscape! 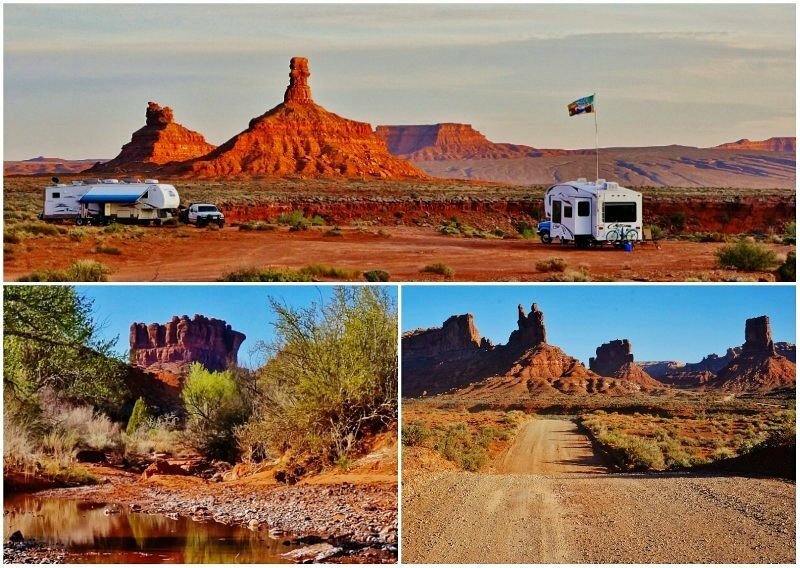 Those same Bisti boondocking buddies told us about a free BLM area called the Valley of the Gods in southern Utah. They had camped there at a few weeks earlier and were so impressed they were headed back. We set a plan to meet up with them on our way west. 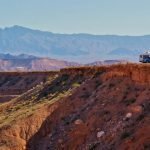 The road in is a little rough and full of dips, but I figured if they got their 40-foot fifth wheel in there I should be fine in our 30-footer. Turns out the road wasn’t too bad and man what a beautiful location. You couldn’t ask for a prettier desert landscape. I half expected John Wayne to ride by on a horse. We filled our camera memory cards every day and enjoyed multiple exploratory hikes in the numerous canyons and washes. Being so remote the night skies were out of this world! 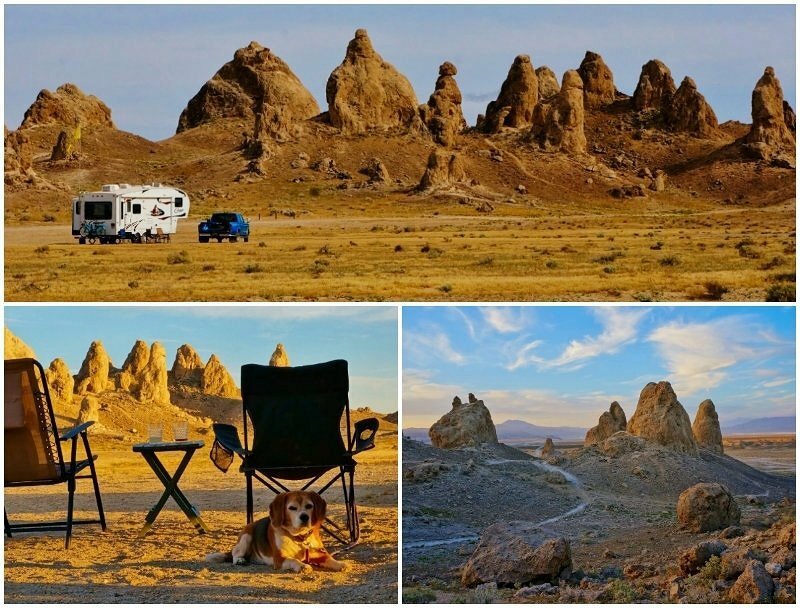 Camping on another planet is what Trona Pinnacles feels like. This was our final desert campsite of spring before we headed to the coast and back up north. We had the place pretty well to ourselves while enjoying the peace and tranquility and warm spring days as temps reached into the 90s. Camping is free but the road in is a little rough, several miles of dirt, washboards, and some rocky patches. But for those that venture in a truly unique camping experience awaits. We wish we could have stayed longer but even hotter weather was on the way. We had to skedaddle for the coast. After months in the dry and barren desert, it’s always a treat to return to our more familiar lush coastal haunts. 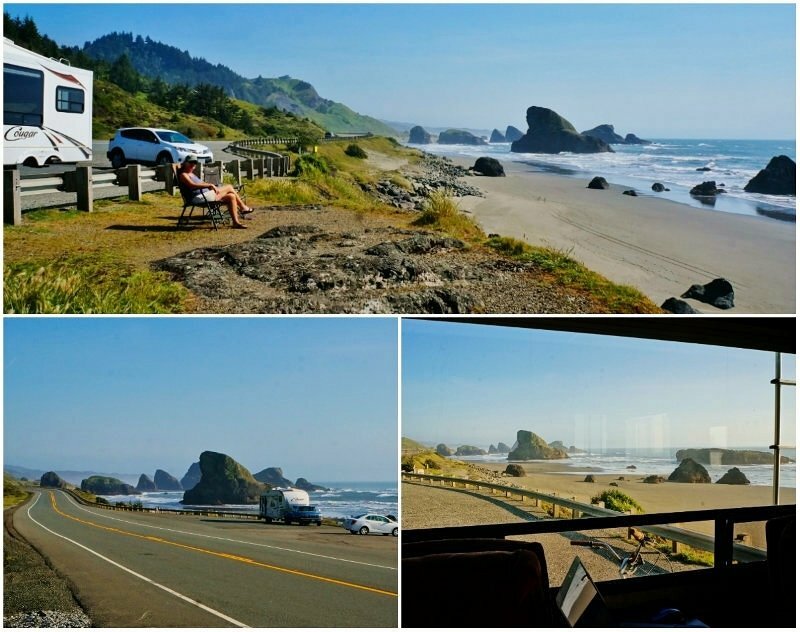 While heading up the 101 highway on the Oregon coast, we decided to stop at one of the countless scenic pull outs to picnic, enjoy the view and take a stroll on the empty beach. Our plan was to stay to sundown then move on, but a huge dense fog bank suddenly rolled in making travel risky so we stayed the night. Next morning after a quick goodbye dog walk on the beach we were off with another cool memory for our growing bank. We camped 4 months here from June to September so you know it must be a very cool spot. 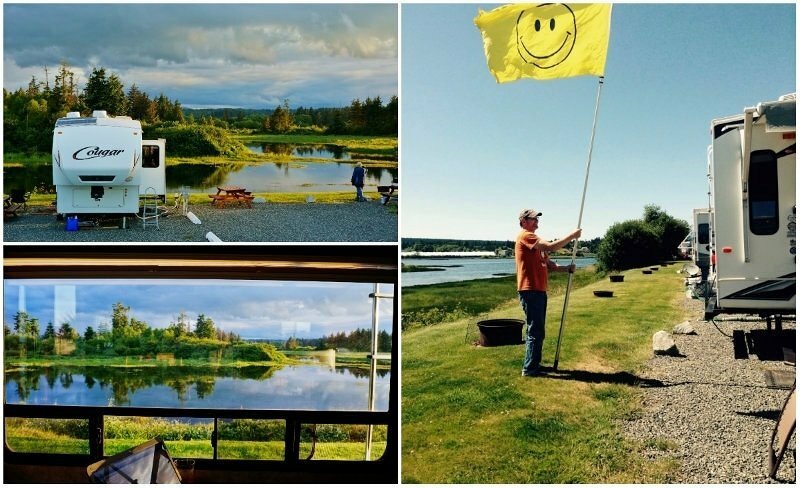 Our campsite backed onto a lush tidal salt water estuary teaming with birdlife, a favorite being daily sightings of majestic bald eagles. On the other side of the park is the Discovery Passage waterway and to the north a pathway out onto the Tyee Spit. Daily dog walks out the spit and along the Campbell River waterfront were staples during our stay. Anne had her boat moored not ten minutes away in a local marina. She took full advantage with tons of boat trips while I busied myself renovating the RV. I did join her for one special boating day. I can’t think of a better place to spend the summer, we are likely to return again in 2016. 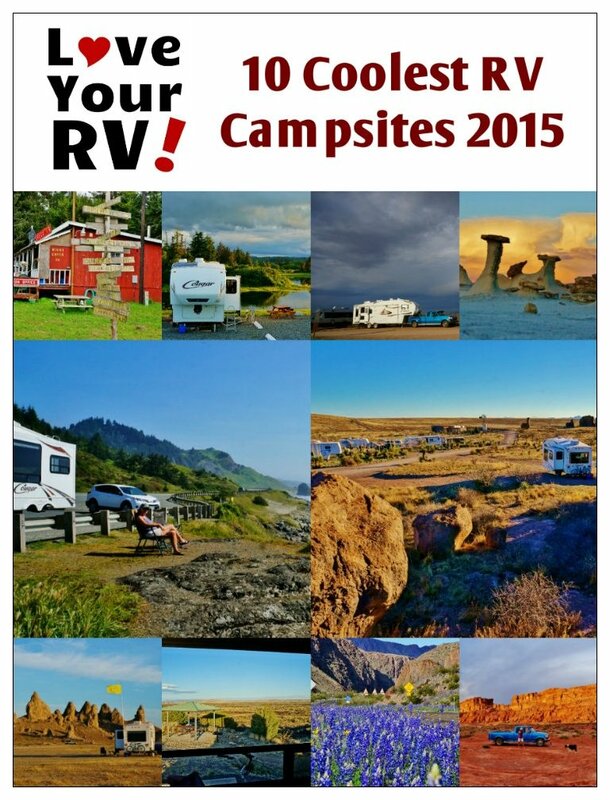 Finally the last in my 2015 coolest campsite list. I had to include his one. 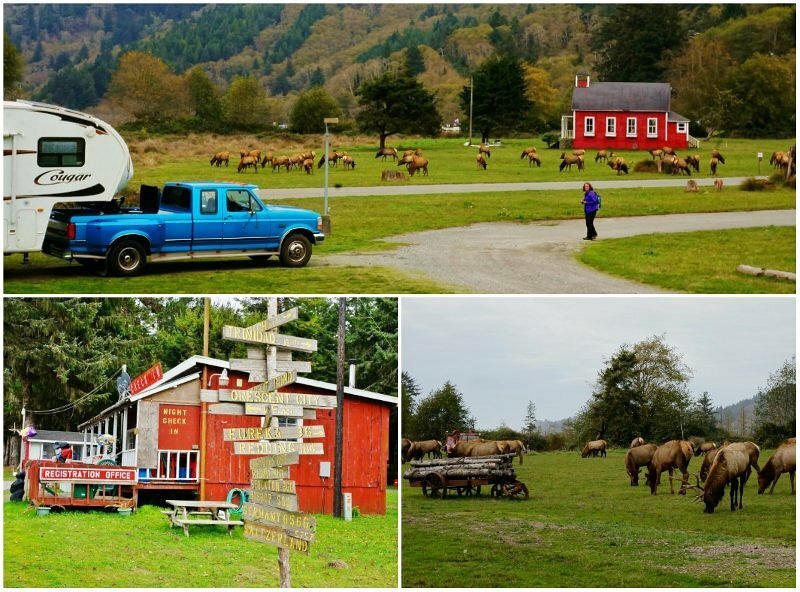 Tell me “Have you ever camped in a herd of Roosevelt Elk?” well we have! We’ve passed this place many times and on occasion seen elk in the campground. So, this year planned to stop over hoping they might grace us with their presence and boy did they. I had to drive the rig right through the herd just to enter the RV park. So cool!